When not solving problems, telling jokes, or playing Ultimate, Patrick Vennebush manages online projects for the National Council of Teachers of Mathematics. He received his undergraduate degree and an Alumni Achievement Award from Penn State, and he has a master's degree in curriculum and instruction from the University of Maryland. He lives in northern Virginia with his wife Nadine, who laughs at 80% of his jokes; his twin toddlers Alex and Eli, who only appreciate 20% of his humor; and his golden retriever, Remy, who has never been very good with percents. 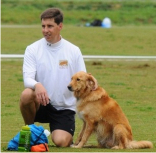 …the author, because he loves the sport of Ultimate; his dog, because that's what golden retreivers are supposed to do.